Are your Goals Empty or Full? My sales manager gave me and each sales team member a big yellow envelope. He then asked us to write down our goals for the year, place them in the envelop, sign and seal the envelope and pass them in. Have You Set Your Own Goals? joined an office equipment sales team. Being new to sales I did not know what to expect so I went with the flow. I recall the feeling of empowerment as I wrote my goals down – a feeling which lasted at least until late afternoon. To this day, however, I do not recall the goals I wrote down. The TV game show ‘The Price is Right’ has been on air almost continuously since the late 1970’s in one form or another. Contestants are asked to “Come on down” by the host and exhibit outbursts of emotion as they are overwhelmed, with audience encouragement, as the progressive list of prizes is unveiled and then given the opportunity to win. What would happen if the curtain was drawn back and there was nothing there and the host said “Tonight you are going to name your own Prize“. I suspect, after the initial shock and stunned silence, the contestant might make some suggestions for the prize pool. I, like most people on the planet, find it is much easier to let others determine goals. We wait for the curtain to be drawn back, our goal revealed and we get excited at the prospect of a large reward. Game shows have done well in all cultures. I can recall a few ‘winners’, however, it is more common contestants will leave with just a small prize. Often you will see a contestant who could walk away with a reasonable prize risk it all for the chance to ‘win it all’. After all, they came with nothing they may as well take the risk. The reason this happens is the contestant has not yet taken ownership of what is already theirs. Contestants who have clearly defined outcomes, for example ‘a second car for the family’, will take a reasonable prize pool as they mentally take ownership of a well defined preset goal. Once a link is established with a goal they are totally engaged with it is easy to stop and take the prize. 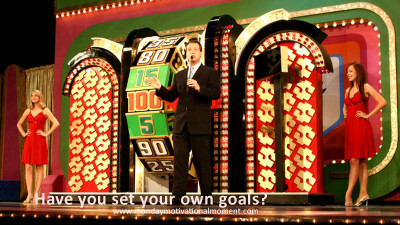 Goal setting is probably the most talked about topic in business and sales. Nearly every business plan template I know includes a section on specific, measurable, actionable, realistic and time-framed goals, or similar. In sales goals are set for sales volume and margin. Often specific non-monetary account and territory specific goals are also included. While both of these goals are great, to achieve them you need to embrace them as your own and commit to actions to make them happen. If I was working in a sports store and my manager said “This year everyone in this company will run a triathlon this year” most people would accept it as a goal intellectually but not engage. This is like in the game show contestant opening the curtain and finding out what they are playing for. In this case it might not be so pleasant. To embrace a goal you need to be fully engaged emotionally and intellectually. The sports store manager could engage everyone, and perhaps get a few others to join in, by saying “This year I will be doing a triathlon to support the Children’s hospital. If anyone wants to join me the store will support you with all the equipment you need. I would also encourage others to support this cause by supporting this important cause“. Leadership, allowing everyone to engage in a personal goal in the best way they can without feeling guilty. The difference is the new goals are personal and easily embraced emotionally and intellectually. They allow for setbacks and mixing up of short term goals to ultimately achieve what your main goal. From that first sales meeting I learned the power released in the process of setting goals and the importance of creating goals. It is in embracing the goal as your own, creating the daily, weekly and monthly target and measuring the small successes where he real power of goals lie. Identify four or five things which you are passionate about. These could be simple things like “I want my son to talk more with me about what is going on in his life” or super challenging like “I will climb Mount Everest“. Whatever it is you need to be fully engaged with the goal and really want it to be so. Take some time to plan out what you need to do every day, week and month to make this a reality. e.g. Make at least three calls with you son each week. Walk further up the Devil’s staircase each day. Setting goals is great. It is setting goals you are fully engaged with which will change your life.